Improvisation is great for dance but not so much for performance marketing! Order custom printed Jazz Dance Postcards to get the word out in advance. 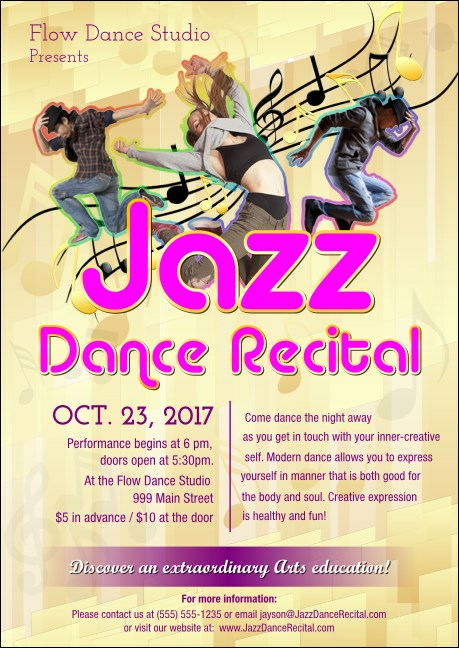 Three dancers leap across the center of this musically minded postcard template, accenting its twenty available text lines. Increase the harmony of your promotional efforts with posters, flyers and more from its matching event kit. Approximate size is 4.25" by 6"
Add pep to your event’s promotional step with TicketPrinting.com postcards!